Here is a real classic for you. 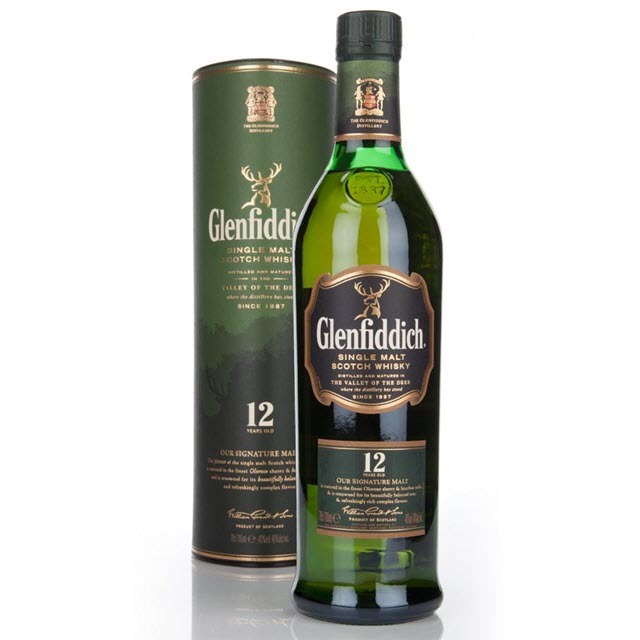 The Glenfiddich 12 YO is produced by William Grant & Sons, and is a product with a long history. In their marketing they now say this is the world's most awarded single malt Scotch whisky. The basis for this claim is that the Glenfiddich range has received more awards since 2000 than any other single malt Scotch whisky in two of the world’s most prestigious competitions, the International Wine & Spirit Competition and the International Spirits Challenge. The Glenfiddich 12 YO has been matured in 15 % sherry casks, and 85 % bourbon casks. It is widely awvailable, all over the world, in all kinds of sizes. In Norway the price for a 70 cl bottle is NOK 475 (item number 676001), in Sweden the price is SEK 399 (item number 440), and in the UK around GBP 24. Nose (21/25): Malt, milk chocolate, slightly oaky, and with a whiff of smoke. It is mildly fruity, tending towards citrus notes with oranges dominating. Give it time in the glass and it will reveal a spicy feel as well, and show more body. Taste (19/25): The mouthfeel is on the thin side. Spicy, fruity, floral and a bit watery. Pepper, oranges, ginger, oak, malt and a hint of ashes. Quite a lot going on actually, so it is a complex dram. Finish (17/25): Dies off fairly quickly, the lack of body does it no favors here. Balance (19/25): An Even Steven whisky, well-balanced, well-crafted, but unremarkable. The single malt crowd is not the primary target group here, I believe, and that's quite OK. It is very approachable, and I can certainly see the wide appeal and understand the sales figures.